These Double Window Envelopes are fully compatible with checks provided by your ADP Service Center. The tinted pattern printed inside the envelope provides complete security of the confidential information on the check. Protect payments going to employees, clients or other businesses. The security pattern keeps the checks you send confidential, and the gummed design ensures quick and easy closure. Avoid the hassle of manually addressing envelopes. 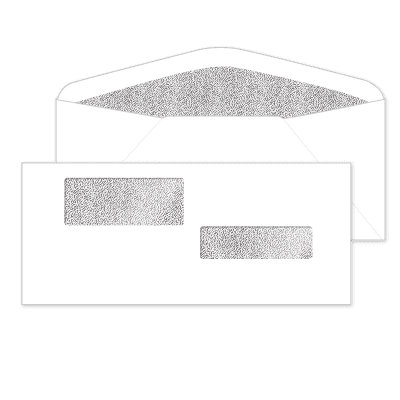 Your checks will perfectly align with the check envelope's double windows allowing your business address and recipient's address to show through. These envelopes are constructed with 24 lb. white wove paper that can stand up to wear and tear, ensuring that they reach their destination in the best possible condition. Copyright © 2019 Form Center ® / Mines Press, Inc. All rights reserved.